Psycho/Social failure (jobless psychologically downtroddens with grievances), a dearth of democratic institutions that incorporate Islamists into decision making, or Islam’s structural organizational management design factors and conflicts presenting during its attempted reformation, combined with the adverse individual and systemic — to include global — influences resulting from the violences’ traumatization of the attacked polity? Because of the likelihood that guessing wrongly would have strategically catastrophic consequences — the conflict between reforming Islam1“Reforming Islam” refers here to the activity which is attempting to weed the more death defying political elements out of or away from the ontologically/spiritually-felt components. and its apparent counter, known as pre democratized (or at least hoping-to-become a little bit plural) Islamism, would accelerate its first competitor on this side of the world, the Anglosphere2Daniel Hannan, Inventing Freedom: How the English-Speaking Peoples Made the Modern World (Harper Collins, 2013), Broadside e-books, November 19, 2013; 25 February 25, 2015 www.amazon.com>, toward its demise — it behooves us to try to get the answer right to the question posed in this title. 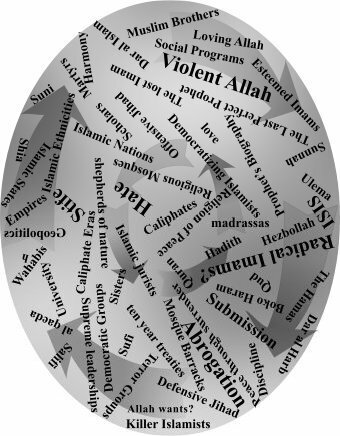 In that regard, although there are multiple influences of Islamic terror’s application, when referring in this effort to that terrorism’s “primary cause,” this essay considers the title-referenced 1) psycho-socio-employment and other economic variables, 2) democratization’s inclusiveness for changing perpetrators’ attitudes pertaining to the use of violence, 3) Islamic formation’s and reformation’s structural (organizational management factors) design, to include the counter reformation’s actual and prospective sources of supply of persons/terrorists required to commit the usually heinous acts attending their political efforts, and 4) the individual and systemic traumatic influences of the polity-targeting violence. I’ve purposefully addressed those differences in terms of my view — which as expressed throughout these essays is weighted not in politics or economics, but rather Etiotropically3“Etiotropic” means to focus interpretation and management problem solving on etiology, to mean the “source of a problem.” Etiotropic is often better understood when juxtaposed to its opposite: Nosotropic approach to problem solving. “Nosotropic” means to focus on symptoms. engineered trauma management — of their reasonablenesses, where possible, thus without the benefit or distractions of ad hominems applied by one side or the other. So that the reader knows, however, that I am apprised of those arguments, generally speaking, they are that one constituency is declaimed to be psychologically deranged, Islamophobic, and the other is posited to be in the tank for the opposition through enemy agent bribery of mainstays, and invasively hostile ideological penetration of our management. When referring in this essay to the “PRIMARY” cause of Islamic terrorism, I’m using that emphasized identifier synonymously with the etiology of a problem. I intend “etiology” to refer here to a level of problem source that when it and the consternation for it have been successfully addressed, to include having been identified and expunged from the milieu of pains and sufferings attending this matter, there won’t be anymore presenting and linked difficulties: in this case, Islamic terrorism or even jihad. The axiom that you can’t have behavioral symptoms — repeatedly imposed heinous death contrived for political effect — without an etiology pertains to this matter about terrorism, as well. Lastly for this introduction, I’ve divided this essay into Parts One, Two and Three. “One” references the two propositions for which I am not an advocate: the etiologies of Islamic terror are functions of economic deprivation and failure of Islam/Islamism to express either of its selves democratically, as the West understands that expression. “Part Two” shows the SHOM or my view of trauma’s generic influences upon entities alongside what I think are those or particular influences upon Islam, and emphasizing its formation into a managerial structure. That origin has, in this view, presented the basis for that structure’s replication of violence over the organization’s lifetime. As a matter of problem solving beginning with SHOM-view determination of etiology, I’ve summarized that matter as pertains to Islam’s expressions of violence and attempts to stem them through reformation. “Part Three” leaves the conclusion to the reader to decide for him or her self the best approach, at least between these problem identification and solving concepts, to this matter. In February, 2015, a US State Department spokesperson, Marie Harf, passionately exclaimed something pretty close to this: “Instead of picking up an AK, a youth from a downtrodden region would be more inclined to start a business were that economic opportunity available, as opposed to engaging in war.”4Matthews, Chris, Interview with Marie Harf, Hardball with Chris Matthews, MSNBC, February 17, 2015 <https://www.youtube.com/watch?v=Sd0_U87nyoU>. And that idea or closely related ones are purportedly well supported by opinions from American MidEast studies’ academic, some private think tank, and as well currently (in February of 2015) predominating political leaderships. Beginning with one of a few examples of that support, at a November, 2014, Washington Press Club forum Georgetown Professor John Esposito referenced evidentiary-like studies supporting the psycho-social causation view, and then quoted a former CIA, but now well regarded academician’s take on the matter.5John Esposito Washington DC Press Club and the reference to Graham Fuller, “a former senior CIA expert” and academician; C-Span http://www.c–span.org/video/?c4514180/john-esposito November 10, 2014 Paraphrasing it, the West would have to address the social grievances of the Islamic masses, and in particular those adversely affected by Israel’s occupation of Palestinian lands and slaughter of Gazians during the most recent wars, as the etiology of the presenting problem: Islamic terrorism’s manifestation, and particularly for our interests here in the West. Continuing with those examples, but their then being politically strengthened, America’s Secretary of State would asseverate the same and nearly at the same time. And similarly, as recently as February 18, 2015, the American President stated at a conference on combating extremism that Muslim “grievances” would have to be studied and addressed by the West 6President of the United States at an anti extremism White House Summit February, 2015; “On Terror, Gentle Hand or Iron Fist; Obama Calls for Expansion of Human Rights to Combat Extremism”; Peter Baker and Julie Hirschfeld Davis; New York Times; February 19, 2015; Video; http://www.nytimes.com/2015/02/20/world/obama-extremism-summit.html?_r=0, apparently before REAL progress against generic extremism/terrorism 7Jesse W. Collins II, “Generic Extremism: Coming Here Too? !” SHOM Blog January 17, 2015 <shomblog.com/generic/> could be made. When George Bush put Sharansky’s8Natan Sharansky and Ron Dermer, The Case for Democracy, 2oo4, notions about democracy and the attendant concept of freedom to a test in Islamic — as opposed to Islamist — Iraq and Afghanistan, it now looks like he started something, way back there. That president, though, was beaten up very badly about the notion and effort. In his last interview, which occurred only recently, he didn’t back off his belief in the power of democratic freedoms to work effectively against any untoward force. In a TV news interview, a Stratfor Egyptian analyst, Kamran Bokhari, author of Political Islam in an Age of Democratization, opined that grievances apparently massively underlying a core of Islamic terrorism’s occurrence must be addressed, too.9Defcon 3 K.T. McFarland interview of Kamran Bokhari, author with Farid Senzai of Political Islam in an Age of Democratization (Middle East Today); February 18, 2015; http://www.foxnews.com/world/2015/02/18/isis-reportedly-eyes-sending-fighters-to-southern-europe-disguised-as-migrants/ Only now reading his book, which describes major trends in Islamist changing attitudes toward peaceful, to mean voting — as opposed to, for example, bombing, shooting and machetting — approaches to achieving political representation/influence, I took that generally within the context of the interview to mean not just considering economic deprivation, but maybe the standard complaints regarding oppression through condescension of and to Muslim social status, and non acceptance of Islamic self management through its own ways of being Muslims, and other evolving, devolving psycho-social-religio-cultural-political complexities. And, there is more from that writer and his intellectual constituency, which participates in the discussion through consideration of changes in attitudes about democratization within the apparently once and most anti-democratic element of political Islam, Islamism. The newly presenting idea holds that those once antagonists of Western democracy would converge their thinkings toward political and particularly non violent participation in the electoral representation processes. Moreover, to make that change, the former problem adversaries would address the primary concept of Islamically influenced, albeit either secular or non secular depending on the vote, state run managements, the goal being to one way or the other meet some of the earlier represented Muslim social grievances stemming out of the previously mostly secularly and dictatorially operated national managements. Historically, they got in charge after the early 1920s demise of the Ottoman, the Caliphate, and a few other places, like those conquered further out, e.g., in far flung parts of India considerably more distant from the once centralized command established in Turkey and throughout the mideast. The outcome of the prospective convergence might, which is actually “hoped for” by those who study these things — academes demonstrating their ever-strengthening relevancies to the world — to be that violence would no longer be an appropriate alternative for addressing differences, and then social management shortcomings resulting therefrom. Apparently supporting that perspective and hope, United States political leadership activities have included considerable efforts to incorporate the Islamic, and today even “Islamist” voices and judgments, and no matter that they may have once belonged to a prospective enemy, into domains of US government power and influence. I’m a fan of the work done by Ms. Hirsi Ali in both her efforts to stop violence and other abuses upon women in the Islamic world, and then to go further, completely reform it as well. Because I believe that she would discuss these matters of Islamic violence with just about anybody — who was not armed during the conversation — I don’t think she would push too hard against the political-inclusion-of-previous-hostiles/-Islamists-into-the-halls-of-power model, albeit she probably would make a case for being given equal time. However, and regarding both propositions, she has stated fairly emphatically in her most recent work that she doesn’t believe fixing economic deprivation or strengthening political input is the most direct road to peace with this group.10Ali, Ayaan Hirsi (2015-03-24). Heretic: Why Islam Needs a Reformation Now (Kindle Locations 295-297). HarperCollins. Kindle Edition. Even more directly stated, Ms. Ali argues, at least somewhat as do I in this work, that violence is inherent to the Islamic religion’s core principles of both belief pertaining to how the human consciousness is constructed, and how that functioning is best to be managed. Because my opinion is that she is correct, except that I’ve added consideration of the individual and systemic influences of trauma into the problem identification and solving melee, I’m likely not the best person to present a prescription related to or stemming from either of the two oppositional views about jobs and democratization of aggressive cults*, at least without reforming — probably eventually to mean removing — of the managements’ hierarchically-based internally and externally directed hegemonically/violently reinforced control structure which makes the latter that way (violently cultic). “Cult” refers, generally speaking in this work, to organizations that exploit their members’ individual ontologies for the primary purpose of advancing the overall’s political — to include enhancing pecuniary interests — power. Although the term is not applied in these essays, usually, to beat up or otherwise discredit the group referenced as such, it does emphasize as a negative an identifier of collectively administered, doctrinally standardized, stringently conforming, and most probably pathological individual member to correlated public-/masses-management controls. Moreover, they can and often do come with their own systems of logic that get extra external attention when they include into their member psychologically manipulative strictures prospective applications of violence, and even in the extreme for maintenance of that control. For example and among other things, death for apostasy can assure the application of image maintenance controls by and from the collective — zero attrition supports the appearance of near ordination of the whole program, with everybody in it feeling part of the always-thought-to-be-ascending comfort and joy. Death for defamation adds both circumspection and politeness to group interactions. Death for blasphemy strengthens definitional focus on the spirit component, keeping members worshipping the approved words, symbols and philosophical notions which support the program in charge. And, death for psychologically dishonoring one’s family extends cult systemic control management authority for administering overarching organizational principles — everybody watches and attempts constantly to conform everyone else — into that (familial/tribal) core unit. Having said that, those death-based controls are not allowed, in this example application to Islam, in non Islamically managed countries such as those comprising the Anglosphere, and as say where they are so allowed/led in Iran, Sudan or Saudi Arabia. Giving us another perspective, the organization, therein, could certainly be considered non violently cultic in those (Anglosphere or European) vicinities. But if a transnational traveling Muslim, I would be circumspect regarding where I would visit, lest I should find myself subject, all of a sudden, to greater constraints. Having said that, in the former theory/notion/idea regarding what’s wrong with violent Islam, and emphasizing the violence, those students, and particularly the academes referenced above, and even some non academician-styled-explorers of the subject like Benjamin Hall, an activist war correspondent of the first class and who I admire greatly for his courage, perseverance in the presentation of dangerous-to-even-explore truth, and other work — the fellow is dedicated to stopping both the individual suffering and mass murder caused by ISIS and still ongoing during the period in which this article has been written — argue that some foreign recruits for jihad mostly entertain and then actually go to the battle zone because they are not engaged in meaningful employment. Hall opines11Hall, Benjamin (2015-03-10). Inside ISIS: The Brutal Rise of a Terrorist Army. Center Street. Kindle Edition., briefly, that ISIS recruitment draws or otherwise benefits somewhat from economically disaffected Muslim youths, particularly foreign ones. And there’s money to be made, which he specifies in amount and product terms, from collection of the war booty by jihadists doing criminal work, like engaging in kidnapping, armed bank robbery, siphoning off of contraband such as other people’s oil, gas, cigarettes, tech equipment, and etc., in the takeover zone. That fact appears to sometimes draw a certain type of, to mean here economically as opposed to religiously motivated, applicant. Criminal enterprises, though, are not the economic address referenced above by either academes, politicians-in-charge, or other advocates of the Islamic-violence-caused-or-advanced-by-economic-stress view. Rather, they are discussing the needs for legitimate jobs programs, apparently to be provided in adequate mass to still the streams of disadvantaged youths headed toward service in the new Caliphate, now located somewhere in what was once northern Syria and Iraq. Regarding the other matter, i.e., democratizing Islamists and in particular their being invited to participate as inputters into top level world-influencing decision making, much has been made in non apologist and particularly the new media’s domain about once Muslim Brothers, Sisters, or their relatives and associates now working in positions of authority, or at least higher level echelon advice-giving. While non apologists contemporaries have been driven into fits of disbelief of the underarched (nobody except the president of the United States and a couple of academic groups seem to adequately know about it) theory’s application, and others from the same skepticism argue that the more obvious aspects of the appearance of merger — meaning convergence of Islamism with democracy — is really, and of course a very nice thought if sincere, from the opposite and more negative view only an obviously disingenuous/contrived element of the so called stealth jihad model’s implementation. In the opposition model’s interpretation, Islamists have been historically clear in and even overtly expressive of their aims to dismantle, change, transform or otherwise destroy, at least after they’ve seized the war booty, the West, and particularly America. “Stealth jihad” is no longer just a surreptitiously manipulative secret theory about sneaking up on the non bright, or maybe better said just differently focused, but an ongoing and activated plan for takeover being assiduously administered throughout the Anglosphere, as well as major components of the Continent. Subsequently, and not wanting, again**, to naively — meaning without proper defense — submit tolerance-based methodologies to undermining by intolerant management constructions, considerable resistance to these newly demo-converging Islamists exists, whether they swear off violence or not. From the 1920s to the late 1980s, Western governments and their peoples had considerable experience dealing with the wishful thinking influences attending that era’s most popular convergence doctrine — the merger of two and disparate ideas: Adam Smith’s thoughts regarding economics, and Karl Marx’s. But because one side saw the other as using the mergering discussions as ruses for takeover, and because each group’s epistemological level thought-constructs were essentially incompatible with the other’s, the hoped-for get-together never really worked out. Albeit, some haven’t given up trying to, yet, make it do so. Diana West documents12Diana West, American Betrayal: The Secret Assault on Our Nation’s Character (St. Martin’s Press, 2013, from and for the so called American conservative perspective, that twentieth century struggle and both its real and near damages. Generally speaking, they culminated in the Cold War of 1947-1991, and other related unhappy times. In that light, convergence of Islamism with democracy, if accepted by, incorporated into, an otherwise kuffur, kuffar, kafir, kufr, or Kfr13Kafir, or the like spelling, is the term representing the umma’s identification of people or other masses who live, function and otherwise believe outside of Islam; but the name abbreviation label “Kfr” was just a slang for “kafir” adopted between young Muslim writers from Britain as they used it to facilitate their discussions while trying to talk both Muslims and Kfrs into joining their increasingly Islamist organizations, one of which was entitled Hizb ut-Tahrir polity, is from the integratee’s perspective akin — worst case — to acceptance of the Trojan Horse*** into the midst to be conquered, apparently in this plan, though, without the convergence’s being attended by physical violence, only Alinsky-styled Chicago-based political takeover-from-within theory and application. ***The “Trojan Horse” analogy with Phares’s thorough remembrance-styled documentation14Phares, Walid (2014-03-18). The Lost Spring: U.S. Policy in the Middle East and Catastrophes to Avoid (p. 94). St. Martin’s Press. Kindle Edition. Or, at least that appears to be a fear, that the convergence is actually only phony-baloney, to mean not occurring because of a sharing of the value of the principles of being human otherwise developed mostly by the British and then Americans for over a thousand years, but just for an attempt to gain control — “a train,” as the Islamist Prime Minister of Turkey once said, “that takes you to your destination, and then you get off.”15Turkey Prime Minister Recep Tayyip Erdogan’s quote oft referenced either by the circumspect, or by Islamists attempting to emulate his country’s model of Islamic convergence with secular democratic government. In his already referenced work, Kamran Bokhari brings systematic clarification to the current and maybe similar convergence-based subject. And he doesn’t just hope for better things to come from application of the democratizing of Islam through convergence theory, but shows some serious progress; or at least he thinks it’s serious. As proof that Islamists can not only turn themselves around, but do it practically in mass, he refers to, among other evidentiary-presentation efforts, how the once violence-supporting Egyptian Islamists organizations al-Gamaah al-Islamiyah and Tandheem al-Jihad, have sworn off violence-for-political-change, adopting instead the commitment to the more Westernized and peaceful civilizationally approved approach to both that change and its even deeper correlate, transformation. In the mean time, I think — apparently because I’m a sardonicist16Generic Extremism Coming Here, Too? Charlie Hebdo Influences on SHOM’s Lexicon,” Jesse W. Collins II, — those now friendlier jihadists from east of Madagascar-to-Mauritania-to-the-about-to-be-new-South America-to-the-Philippines and up again into the stan-ending countries south of Russia and East of Europe are finding themselves in states of euphoria, strengthening their English language skills for the easier than rain takeover of the heart of the West. Having such a chance at this kind of greatness only once before in its fourteen centuries, no one today would believe that such opportunity could be presented to the faithful, and in particular twice in one millennium. A true historic event to see Allah work, not equalled since Islam converted the otherwise all-conquering Mongols away from the joy of killing just for the sake of it, to doing it instead with meaning — for Allah. We then applied this model of Islamist democratization to seven different case studies. Our main category was the Muslim Brotherhood genre, which constitutes the bulk of Islamist groups. The second most significant grouping, the Salafis, is a recent entrant to Islamism and has joined the electoral fray after years of rejecting democracy. Next we turned to al-Qaeda-style transnational jihadism, which remains among the most vehement opponents of democracy. We then looked at the Taliban, who represent the classic case of nationalist jihadists who have exhibited signs that they are willing to join the political mainstream but still question the validity of democracy. Our fifth case was the only one involving a state actor, namely, the Islamic Republic of Iran, whose political system is a hybrid between parliamentary democracy and a unique type of Shia theocracy. Case number six involved Arab Shia Islamist groups in Iraq and Lebanon, whose engagement with democratic politics is a function of pursing their sectarian interests within multi-communal contexts. Lastly, we explored the lone case of former Islamists who have embraced secularism, namely, Turkey’s ruling Justice and Development Party (AKP). Of the proponents of the two theories about the benefits of either of the prescriptions for addressing Islamic violence (jobs and ideological/methodological merger), I’ve enjoyed Bokhari’s, most. He makes no bones in his evaluations of mid east academes going seriously polemic, thus, apparently questioning their root credibility. And he promises at the beginnings of his recent work to not do the same. Better than that, though, he brings hope for those wanting to think, wishing even, that Islam is heading in a direction other than cataclysm with the West. One major point pertaining to Bokhari’s contribution, however, disturbs me. He said while working on the third component of his Phd18“Moderation Among Salafists & Jihadists” By Syed Kamran Bokhari; “Draft paper to be presented in the ‘Civil War Settlements’ panel at the Annual Conference on Security Studies co-hosted by the International Security & Arms Control Section of the American Political Science Association and the International Security Studies Section of the International Studies Association at the Lyndon B Johnson School of Public Policy, The University of Texas in Austin on Nov 16, 2014” that he would be in the field during January and February of 2015. Recognizing the influence of some of the stressors relating to the prospective realization of his convergence/Islamist violence-moderation theory, I just hope — and even wonder while writing this if, yet — he’s made it back, ok.
Fundamentalism’s the Cause? Maybe . . . but I think it goes a little deeper than even that. Because some texts from Islam’s ancestrally and constitutionally initiating documentations, the Sunnah, admonish Muslims to apply violence — “Strike terror in their hearts;” “When you find a disbeliever, smite them on their necks;” “There’s a Jew hiding behind this rock, come and kill him.” — some on the non psycho-social argument side of this debate would and do frequently blame Islamic fundamentalism for the deeds. Adhering to those ancient verses/scriptures/writings, some Muslims, likely fundamentalists, are seen as randomly following their lesser controlled psychic impulses when offended, or in any other way feel obliged to kill somebody. 1) Effect a majority controlled entity’s political position, one example being that Israel’s currently established nation state be returned as Allah’s land and to Muslim management; and for another, the return of Andalusia (Spain) to Allah. The Islamic organizational management structural tenet supporting these terrorists’ demands is that once a society/land is conquered by Islam, it belongs for evermore to Allah. And it doesn’t matter whether those lands/societies had been established even prior to Islam’s arrival. Although seemingly irrationally unfair, that idea about Allah’s lands staying that way forever stems, as most clearly depicted by recent Islamist mid twentieth century evangelizing writers Mawdudi, Nabhani, and Qutb19Qutb, Sayyid, 2005-09-01. Milestones, Kindle Edition., plus those, like Ibn Taymiyya, forming or interpreting for the ulema dating back to before it stopped trying to figure itself out, argue that Islam functions theoretically and behaviorally through its origin’s interpretations as being immutably in sync with the universe. That includes such things as planet alignments, earthly molecular harmony and virtually all expressions of life. In their responsibilities as divine caretakers, shepherds, stewards of that harmony, conquered lands, societies, and other life resources once belonging to kufur, kuffar, kafir, or Kfr are then more respectfully managed by Muslims in accordance with Allah’s wants, dictates and certainly approvals. Anything else, and particularly less, would be an insult and even assault upon the deity, which cannot happen, or if it does must be reconciled for Allah.20Sayyid Abdul A’la Mawdudi, 1981, Towards Understanding Islam, The Islamic Foundation, Chapters One and Two, Amazon electronic In this not-always-well-advertised-in-English schemola, once Kfr-managed lands pretty much existing anywhere in the global have been made right with Muslim divine occupational management, they must be kept that way to prevent Allah upsettedness. Moreover and a little bit like Marx’s billion plus person displacement and death caused by scientific-like claims and theory regarding who-owns-what of the various airs we breath, ALL the land in this jihadist’s creed was Allah’s in the first place, making right-of-return a fairly ambitious thing21Ye’or, Bat, 2011-09-16. Europe, Globalization, and the Coming of the Universal Caliphate, Kindle Location 309. Fairleigh Dickinson. Kindle Edition.. Hence, man’s establishments and then changing of international boundaries through treaty, not to mention property right ownership with deed and Western/world court house registration, are never accepted, at least over the long and real run. 2) Disrupt with organized trauma dar al Harb’s management capacities to stop Islamic forced expansion into a society not part of Dar al Islam. Vladimir Lenin explained it this way: “The purpose of terrorism is not to kill people, but to terrorize them.” His idea, too, apparently being to change the minds of those who remain after the sampled unfortunates have been sent off. 3) Advance a revolution or to counter attempts at reform, and that includes reinstating/resurrecting that Islam which existed under one Caliphate as it did prior to its disintegration in 1924. Within this scheme, assets (oil) would be returned from individual fiefdom monarchies and other leaderships and placed into Islam’s coffers, and then redistributed worldwide to the Muslims of that whole. 4) Globally dismantle the Western-based more secularly-oriented method for social/nation management, and in the process, re establish the purer non secular historic/traditional approach to the Muslim way of life. That effort would be, however, and is on a collision course with the recent reformists era’s Islamist writers/scholars/thinkers who are attempting to better define such secular vs non’s influences, and as a new approach to democratization so that the latter might be merged with traditional Islamic doctrine. An idea behind that activity holds that as democracy assimilates Islam, and vice versa, both will undergo some kind of transformation, facilitating a meeting by and of peaceful minds somewhere in the center. Countering the hoped-for movement, Islamic doctrine protectors have historically concluded that the answer is simple: dispose of the people on either side who would support the proposed ideo-methodological merger. Hence, that would be one structurally dictating rationale providing urgency to the ISIS-/Boko Haram-/Al Qaeda-like accelerations of the anti vs. reformation contest during the beginnings of the twenty-first century. 5) Restore a Caliphate which, alone — i.e., discontinuing the more charismatic approach of the nearly last hundred years where anybody so imbued and receiving the proper education/exegit support can become Kaliph-like and order up/conduct violence on behalf of Islam’s defense or to meet offensive (against) Kfr invasion needs and interests — decides jihad/fatah policies, thus also then, according to the Sunnah and Muhammadan marshal tradition, controls the disposition of the conquered’s individual and national assets. When this tenet is restored, the returned/reinstated Islamic structure would fuse fighting-Dar-al-Harb-for-Allah with an increased Muslim standard of living, reproducing the eco part of the engine that originally drove the violent Allah’s Islam into world greatness. That is, jihadic aggression means war booty — by the book (Islamic literature comprising the Sunnah), individual mujahidin get eighty percent of the take, and the Caliphate gets twenty percent for administering its overall Islam management duties.22Al Hadith is repeatedly replete with explicit directions for divvying up the spoils of conquering through war. *When referring earlier to “Individual and systemic etiological and behavioral-symptomatic consequences of trauma,“ I was and am speaking to those effects upon decision making contributed by a management device/activity/assortment of intellectual problem solving methodologies. Taken as a whole, they form ideology. Regarding the example of Islam, the view here is that that methodology/ideology not only causes current trauma of itself, Islam the entity, but that some of its behaviorally applied through doctrine and tradition is formed out of an historic traumatic condition which perpetuates itself. The referenced traumatic condition as it stems from and interacts with ideology/methodology can actually consist of several categories. One of them — already discussed in these SHOMblog essays — albeit systemic in most of its consideration provides ETM TRT SHOM managers (me) with a simple mechanism for strategic understanding/overview of and for general grouping of the targeted/attacked/traumatized polity. “Strategic” means here that the SHOM administrator would not try to fix some contributing variable like economics without addressing that traumatic influence, lest it make the first attempted remedy inconsequential in its effect. Here, again within Table I of this publically presented SHOMblog essays, is a reference to both the more generalized traumatic effect, and my view of Islam’s traumatic (traumatized and traumatizing) status, and how it got to be that way. Try to disappear, psychologically speaking. Cliche — “head in the sand” — and “denial” most often describe this element of systemic traumatic influence. Its purpose: neutralize by inducing immobility of decision making into this component, for example one third of the overall targeted constituency. While being psycho-pulverized, this group both advocates for and hides behind diplomacy-based problem solving and legal solutions which otherwise are rendered moot by a dearth of enforcement provisions. Is akin to rationalizing a live-in alcoholic/drug addict’s increasingly toxically induced bizarre behavior till after thirty-five years or so of the onslaught, taking what was before unacceptability to the now new norm. Inevitably and within that newness, you are made responsible for it as well; and I’m sorry to say also opined by others and the traumatized self to have wanted it all along — classically coping through individual victim and patho-system hindsight’s perceptual reconfiguration of the pre traumatized entity. Another portion, say again for example a second third, will respond by fighting, which is in this use to mean also caring profoundly to the extent of risking one’s life for family, neighbors, community and nation as a whole. Aggressively support, align with, defend, help the perpetrators — Stockholm Syndrome. Along and in conjunction with the constituency hiding out in number one, this component undermines the efforts of those (in number two) who otherwise would strive to resist the invasion. Systemically Fractured 24Thomas Asbridge, 2010-03-13, in The Crusades: The Authoritative History of the War for the Holy Land p. 20, HarperCollins. Kindle Edition, refers to the fragmented state of Islam coincidental, in that author’s view, to the eventual initiation of the Crusades in 1095. He documents the fracturing of the otherwise planned to be “monolithic” condition as it came about from the seventh century to the ends of the eleventh. And of course, it stands today. Figure 1. Oppositionally and even Orderly25“Oppositionally and even Orderly” refers in this expression to the centuries of same conflicts presenting between sects or thought models, to include, but not limited to, such influences as idea, logic, narrative, ethnicity, doctrinal (exegete) controls, and demographics, like Shia vs Sunni, Salifi-violent vs Sufi-non violent, and/or Islamist political, either democratizing or non, and the same either violently presenting or not., albeit NOT Necessarily Always Linearly 26“NOT linearally” is referring in this application to how one model may, for purposes of achieving short-term or warring goals, align with an otherwise counter, e.g., comprised of completely opposite to the point of historically clashing, Islamic conceptualizations. Enmeshed. Does a reliably presenting — constant — commonality exist within the structurally and trauma divided, sometimes rigidly compartmentalized, and oppositional aspects of its morass? Members of each resident thought model, or sub-ideology, for example as distinguished by demographics, ethnic applications, or, say, denominationally-based sects like Sufism, violent Islamism, democratizing Islamism, Salafism, Shiism, and Sunnism, think its program is the real Islam — true Muslims — and the others are NOT Islamic at all. 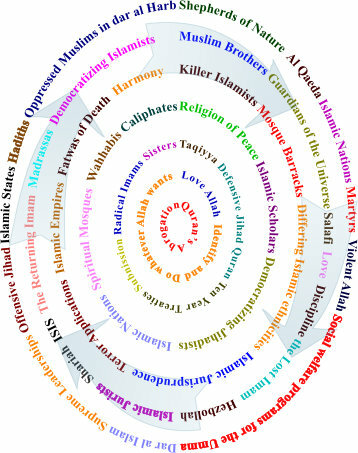 Through those, and many more, commonly adopted differentiations, like those reflected in its kaleidoscopically colored globally rotating image shown in Figure 1, I think that Islam disavows itself as a whole, which doesn’t just culminate in, but over time also adds to the melee, multiple individual and systemic dissociations27“Dissociations” refers here to the psychological separation of an entity’s (either manifested individually or as a collective) epistemological, philosophical/spiritual, and most rudimentary existential values core, and as well, the also trauma-skewed control apparatus that provides for its both every day coping and strategic sense of long-term continuity/ongoingness. — perpetually fragmenting the ummah and some, if not many of the people individually comprising it. Identifying dissociation is by itself, though, not a big event. Understanding how it impedes an organism/psycho-entity from working out of its difficult situation, however, may be. When individuals are caught up in the divided process, and unresolved loss28As reflected in the Etiotropic approach to trauma management, “loss” functions as a consequence of neuromolecular extinction of the memory (synaptic traces) hosting the reality that existed before the event causing the loss occurred. unknowingly rules the day from both its deeply retained cores and behavioral chaotic/hysterical manifestations, adversarially directed forces other than that representing the will of the affected, themselves, can and do take control of attempts to right the problem, to mean reconcile or end the conflict, violence, and etc. Innocent little ummahs (individual Muslims) who are otherwise just trying to experience a loving Allah-led life, but instead who are getting exploited or otherwise wrapped up by sectarian cause participation, incorporation or imposition, however framed, could be analogized as participating in a white water rafting excursion, but without the raft. Having to exist in such swirling states of hectic survival thought, little in the depths get reconciled. Thus, few of the entrapped learn important new things — which I’m sure they would otherwise glean were it not for somebody’s application of the political exploitation and control structural devices — from ontologically-based communion with the loving Allah. Moreover, and referring to most of its history, the entity cannot or does not pull itself together, although some of its components have tried to make that happen. Legacy Muslim/Islamic structural management failures, referring again to the requirement of habitually oppressive deadly force for maintaining organizational continuity, hype the divisions, contributing to their metastasizations. Inter-sect/intra-faith, not to mention the challenges of confronting dar al Harb, political competitions for the souls within the memberships accelerate conflict, encumbering what might otherwise be hoped-for ordinary functioning within the original spiritual aegis. As it is in all religions/spiritual programs, that element of Islam deeply — meaningfully — draws to and upon human ontology. It, then, promotes a self into an experience of expanded, at least prospectively so, existence, which at the spiritually evolved apex is intended to encompass communion with not just a good, but fully Allah/God imbued afterlife. No matter periodic and inspirationally ethereal divinely conveyed bliss, the parallel and ongoing combination of the competing divisions and the rigid enforcement of stringent compliance with the nearly inhuman rules required to support organizational ascendency, forms and strengthens intrapsychic (individual), interactional (relational-couples) and systemic (group/familial/tribal) current pathologies*. Practically, then, most everybody in that multiple strata encumbered socio-political religious system needs, at least when fairly thoroughly depressed, the loving — emphasizing it as opposed to the violent29SHOM distinguishes between psychological compositions of violent vs non violent deities — Allah day-to-day, even hour-to-hour, and in the extreme minute-to-minute just to get by, and that’s if the believers don’t get killed outright by ummah sectarians gone politically, or at the death-management enforced familial/tribal level honor-bound30Discussed and referenced — in II.B of this essay — to Hirsi Ali’s work pertaining to treatment of women in compliance with the doctrine directed familial/tribal rules for watchdog applications, maniacal. Generally speaking, “psychopathology” can refer to substantial depreciation, or where extreme, complete loss of psychological control, and worse, not even consciously knowing that it’s gone, thereafter dumping that wont off to the contiguous — seeing the locus of the loss’s pain in everything else but where it belongs, within itself. Here are a few extra intergenerational pathy descriptors passed down over the millennia. 1) Both intrapsychic and interpersonal incongruities. They are established, first, from organizational hand-me-downs initiated in the entity’s constitution. The interactive model includes doctrinally rationalized and thus exegete-legitimized applications during conflict of deception, putting the principles attending truth-telling during inter- and even intra-group attempts at conflict resolution up for grabs. Allowing falsity to be standardized into relationships, no matter rationalizations — for example, deception is ok as a response to war, and then knocked down as also applicable to only some kind of conflict — repetitively destabilizes those relationships which otherwise function as a cornerstone of the continuity required just to get along with everybody else. Trust, which establishes developmentally through truth-telling, is paramount: required for relationships to be sustained. Done right, that achievement leads to meaningful loss resolution, and thus the ending of the pathology, which can and does in turn end the referenced strife causing both the harm and constant consternation about it. Where deception is even the least bit honored, nobody will reconcile anything, and the whole group stays in the pits, inevitably blaming their predicament on something/somebody else. 2) Deception begets paranoia in mass. Applying such a skewed lens for reading members’ and nons’ minds, declaring them dispensable where and when thought to be appropriate for the cause. 3) Exegete-supported narratives intra-promote entity abuse and aggression depending on interpretations of leadership psychologies; where that leadership is supposed to counter conflict, smoothing away psycho-friction, the learned can and do instead hallmark within themselves the legacy psycho-dysfunction, making remedies, at least part-in-parcel, exacerbate the problems. 5) More simple things like both intra- and inter-discipline academic genocide — every time a critical thinker shows up within the ranks, he and his constituency, and all traces of them and much of their work are done away with, and pretty quickly, which of course didn’t just define so called critical thinking historically for this group, but traditionally, and even up until today. Cementing the conglomeration of pain, the entire misperforming psycho-interactive entourage is repeatedly washed over by obfuscatory hallucinations inevitably required for the perdurable apotheosization of the psychocore. “But maybe those are just characterological and systemic defects that you’ll find in most religions.” say the partially psychologically trained and apologetically inquisitive. Demanding to be accepted and loved by the targeted, or at least collateral globals currently being destroyed by the same MMs (Muslim maladies). Through that and more pathognomony, affected components of the now additionally trauma influenced and otherwise internally warring dar al Islam project the always-painful consequences of its divisions onto dar al Harb, which sometimes can even include the lesser “not true Muslims.” Worse, the both individual and crowd Islamism-driven pathy then attempt to right the perceived wrongs by expanding into the externally and Kfr governed, forcefully attempting to conform it, as well, into the Islamists’ cultic mire. Structurally speaking and until it ends its application of violence and corrects its managerial/doctrinal interpretations of itself — which includes fearfully guessing incorrectly what its deity wants — war with and conquering the outside is the only answer available to the simultaneously traumatized and repeatedly traumatizing, of nearly everything both within and without, Islam. Those are the individual and collective psychological states of the pool of, or sources of supply for, so called “radical” terrorist candidates. That pool, Islam itself, is inadequately defended to fend off, or to support its individual members’ efforts to do the same, entreaties from the cause to murder innocents in its name, making the calamity self perpetuating. Pray awhile; kill awhile; disavow awhile; pray some more. And it will remain so until the death clauses — described next — that hold that circle together are formally extirpated from doctrine. Alter-Stabilizing Targeted/Attacked Polity: in this example referring to the West. In this panel, I’ve presented what I believe occurs for Islam, and why, when the above referenced expansion — into the formerly resistant (to conquering by Allah) first Oriental, meaning most everybody’s Mideast in this period, and then Western segments of dar al Harb — began, and then repeated and regrouped/retracted itself over the eons. In this forensic-styled guesswork, which can be valuable for SHOM administrators in the address of deeply troubled individual or group perpetrator cores, Islam’s advance into dar al Harb’s Western components cause the, in this instance thinking-themselves-righteous, invader extra angst. At its inception, the process required that a conqueror child narcissist — although apparently hosted in an actual person, this reference is to the system of thought — incapacitate and then control, if not annihilate its parent epistemology: in this reference meaning the original Judeo and even Christian encompassing, but after the attack now Muslim, ways of being providing for its basic construction. On the one hand, those Meccan-to-Medina rebel and usurper-to-be thinkers from seventh century AD respected their new spirituality-interpreting origins: Jewish, and eventually a little Christian theological, and even some Greek/Roman conceptualizing social and marshalling thought, all blended within the spin enjoyed by Bedouin caravanic story telling. On the other, any remains, too, would have to go, or at least be dominated; and, in a hurry. That is, assuredly, once a creative narcissist decapitates his parent constituency, there’s not any going back, seeking forgiveness. No voting (male) survivors to do it in that early era, if they were even so inclined, as was recently the evangelist, Franklin Graham32Forgiving ISIS head choppers in Libya; thanks be to Franklin Graham’s public declaration on Greta, Fox News,, who may have been trying to fill in what’s been missing since this ancient problem’s startup. That ascension of or to control in such a short time can, itself, be traumatizing for the new (621-632AD) leadership now finding itself in charge of the world it is acquiring, and with the added pressure of maintaining the new image, i.e., saving face with Allah’s followers’ — apparently now seeming to present always through grace — notions of near deity perfection. Thus, the seventh century battles for Medina, then Banu Qurayza and Khabar . . . later the death bed command to efface the Jews from the peninsula, were not, by themselves, to this trauma management view the import of the history as it applies to our lives of today. To me, although significant, it was not the oft referenced inherent contradiction depicting the hypocritical anti-morality of a prospective holy person that makes this story salient in today’s schemes of struggle. Other nations, for example those fighting the Peloponnesian War (431-394 BCE) would and did execute captured soldiers in like amounts from both sides. However, none of those examples were motivated by an attempt to steal the crux of a competition’s theocracy, ideology, social methodology, and then wrapping themselves in it as if ordained by an originating act of divine revelation and commandment. Hence, the criminally-inspired theological lock on Islam’s use of violence to both instantiate and, then, perpetuate itself. The original revelation host claimed legitimacy of its interpretation of a two millennia old theocracy, and the actual followers, i.e., descendants being interpreted/conquered from that period, didn’t go for it. It’s said in the conqueror’s organizational literature that persuasion techniques used at the beginning while in Mecca were given over in Medina to more rigid Behavioral applications of force. “Accept the transformation of power to a new seer of your old religion, or reap the consequences.” They were war, theft of all that they had, murder of individuals, and attempted genocide of the remaining whole. Those People of the Book, even seemingly when wiped out, didn’t capitulate. No matter that as long as they existed as a part of say a diaspora somewhere, they wouldn’t give up their own approach to ontological management of themselves. In that capacity, they became the ever-present evidentiary base reflecting the crime — production of an adapted if not outright phony religion otherwise being plagiarized to suit another’s, most likely the plagiarist’s, purposes. Thus, the witnesses had to go. The method — manifested then and now as violence committed on behalf of this Allah’s interests — for that sending off had to become institutionalized. Jihad, number “d)” of course, would meet, and still does today expansion into, projection onto, and denial-of-the-original coup or organizational-adaptation needs. A less obvious, except when bound up with the (only) periodic publicizing of honor killings, violence-used-for-tribal/familial and now local control mechanism is the method whereby organizational — same same — individual/family/tribal members enforce cult parameters. So connected to the murdering, stoning, burning, stabbing, beating, hanging, shooting, slaughtering, and running-over-with-SUVs for honor component, this category of control-through-application-of-violence could be registered as “e).” I’ve written, some years ago, an article that attempted to define that process’s generic epistemology as a Behavioral-to-Systemic phenomenon.33Part III (conclusion) The Good Rebel in Most of us; Distinguishing Good from Bad Rebels; and How to strengthen the former against the latter The same or similar mechanism, thanks to Ms. Ali’s writing in chapter six, “SOCIAL CONTROL BEGINS AT HOME How the Injunction to Command Right and Forbid Wrong Keeps Muslims in Line,” of her call for Islamic reformation book, is given doctrinal support when applied in Islam.34Ali, Ayaan Hirsi (2015-03-24). Heretic: Why Islam Needs a Reformation Now (Kindle Locations 2056-2060). HarperCollins. Kindle Edition. Whatever the origin of the phrase, however, Muhammad’s interpretation of it is explicit and novel. The Qur’an itself spells out the concept in three different places: “Let there arise out of you a band of people inviting to all that is good, enjoining what is right, and forbidding what is wrong: They are the ones to attain felicity” (3: 104). “Ye are the best of peoples, evolved for mankind, enjoining what is right, forbidding what is wrong, and believing in Allah” (3: 110). And later: “The Believers, men and women, are protectors one of another: they enjoin what is just, and forbid what is evil” (9: 71). No matter their particular internally- or externally-focused legal formations, all punishments have in common the cloaking of dissonant-belief in another something else. No matter the belief, the use of countervailing force in conjunction with anything spiritual melds the whole apparatus into a violently presenting Allah (see section III below) — the opposite of the peaceful one everybody else on earth is wishing for. That more aggressive Allah, coupled with the always presenting seemingly conflictual notions between the two, violent and non violent deity, causes the non extreme laid-backs, also in the current called “moderates,” both embarrassment and angst, when they otherwise simply just don’t know how to contend with the duality of their deepest thoughts’ creator. Islam has used and still today uses its core violence-application method repeatedly, reaffirming its essential managerial organizational influence throughout the program’s history. And absent intuitively purposeful intervention by its central target, the West, Islam will no doubt continue to do so for the rest of its existence, i.e., for its evermore. Or, at least until all the Jews and Christians comprising that West are gone; and with them, the Buddhists pacifists, Zoroastrians, Hindis, some poor old dumb Russians and a few NOT-religio-aligned seculars as collaterally damaged pagans. When done, there’ll be no one left to challenge the new, post 621AD, truth about its fabricated-through-takeover spiritual epistemology. Violence, particularly heinously manifested, links existentially to Islam’s core. Legitimize its spiritual supremacy — its own doctrine for self imposed world authority — or be dead. Parenthetically35I’ve had considerable prejudices against inappropriate applications of Behavioral Management and its scientific sidekicks Behavioral Therapy and Cognitive Behavioral Therapy. Here are two pieces of work that reflect those views; The Genghis Khan of Psychotherapy: One Origin and Critical Perspective of Behavioral Therapy (BT) and its Reformation – Cognitive Behavioral Therapy (CBT) , and “How SHOM Interacts with Behaviorally-Oriented Management, and How it Doesn’t” , Behaviorists gone wild, again. As the cult moves, then, into dar al Harb, righteously indignantly expunging the evidence of the original criminal fraud, the encumbrances of internal vacancy, vacuousness, and non hallowed, albeit very hollowed voids upon which the nefarious deeds were constructed, will always further cave, to mean decompensate, from what its members have otherwise aspired to be. Whole. Such is always the bete noir — inescapably presenting psycho-social fate — for conquering usurpers. It is the internal-to-inevitable-externally-destructive falling apart of itself, referring to the dissolution of all that it holds dear. If viewed as a clinical discussion, the “falling apart of that self” would be called decompensation, and can occur even when the entity is on an apparent expansive roll, to mean, going the other way. Expansion into Dar al Harb mandates non-linear acceleration (entropically hyperbolic) of the traumatizing cycle. The moral of this part of the Islamic violence etiology-determining story? It is not about the crime of usurpation of authorship, no matter the repulsiveness experienced when viewing the resultant sweeping loss of life attending the multi-millennia both trauma-caused and traumatizing calamitous deeds. Rather, for this paper, the central thesis is this. When you impose your ways of being, and particularly through application of heinous activity, to mean rigorously standards-defiling kinds of violence, and even when you are only a perpetrator of such evil, not the recipient, you are severely traumatizing yourself along with the entity which helps you do those things causing you and the rest of us the consternation. And although as an activist participant you may be consciously oblivious of that harm you are causing to yourself and your group, its manifestation as behavioral/cultural/life coping symptoms always, as in inevitably, culminates as the demolishing of both individual and collective being. existential elements of identity and its division/splitting (video graphic) of the psych in survival. Later: to add from the ETM TRT SHOM educational program text and a graphics-based video (in this space) regarding targeted polities. In the mean time, the reference to the trauma-caused psychopathology pertaining to this subject — Islamic individual and systemic traumatic psych-splitting effects and their pathological projection onto a notion of a violently inclined deity — has previously in this series of essays been summarized here. In Phases Two and Three of this set of essays otherwise demonstrating SHOM’s theoretical application to ISIS, I’ll provide — for ETM TRT SHOM applicants and those people just interested in its approach — a fuller, i.e., both rational-cognitive and experiential prescription for interrupting and then curtailing Islam’s use of violence to manage its internal polity, Dar al Islam, and then its attempts to conform the external Dar al Harb. For now, here is a significant element of the rational-cognitive part of that discussion. Assuming you are in Dar al Harb and contending (i.e., you are at physical war) with Dar al Islam, direct your remedial focus upon Islam as a whole, a single entity comprised of both mutually loving/supporting and simultaneously presenting cannibalistic-like programs exemplifying organizational decompensation (see figure 2. above). Order it, if the conflict can be reconciled in your favor, that is, when Islam becomes open to joining the rest of civilization’s attempts to achieve management progress, to remove the key pillars that obstruct that goal. Insist, as a component of the reasons for your participation in the conflict in the first place that imams and other members of the current and thus new ulema, change the doctrine, Shariah, to disavow punishment of ontological related offenses. For example, in the minimum, as well as addressing them in the following order, discontinue the death-for . . . clauses — apostasy, defamation, blasphemy, and then jihad in the name of Allah — that currently provide, globally, those controls which reinforce cultic operations. Dar al Harb’s fighting for, and thus insisting upon removal of those controls would, if the struggle were to be successful, pull the plug on the more deleterious aspects of the cult’s management powers, allowing it to right itself as and into the spiritual program its more peaceful members wish it to be. Violent psycho-Allah would, formally, be gone. Dramatically sensationalized executions for Shariah violations in downtown Raqqa would be re compartmentalized by the Kfr world into truly non Islamic if not fully psychopathically group murderous activity. And, ordinary Muslims would be given the opportunity to be what they want, as they otherwise interact with their understandings of an always loving and peaceful — to mean newly and forevermore non violent — deity: something, at least, non maniacal now in charge of their lives. But until Dar al Harb insists on that formal repudiation of masses control through fused Allah-interpreted applications of violence with managerial decision making at the inner cult functioning level, there’s not going to be a demonstrable change of the more externally directed warring on Kfrs otherwise applied under the previous fourteen hundred year old more traditional method for targeting classification. Meeting it along the ideological trail, welcome, Islamism, to convergence with your archenemy, America. It is the approximately four hundred year repository of the world’s people who eventually came to the same philosophical/ideological conclusion as did Maajid Nawaz, probably the best if not one of the most noted seekers and then categorizers of truth, having ventured into Islamism and then been catapulted out — thanks to the once unfair Egyptian prison system. At one of the more difficult turning points in his journey, he would say it like this. “In many ways I think I was a nicer person then, and like so many nice people who seek power, I wanted to force everyone else to be nice. It’s a form of totalitarianism. I wrote an essay37“Part III (conclusion) The Good Rebel in Most of us; Distinguishing Good from Bad Rebels; and How to strengthen the former against the latter“ in another series regarding what I believe is the epistemology of that “forcing,” emphasizing that it is no small thing, as it brings — no matter that you are only involved in the rhetorical as opposed to the head-severing part — about periodic man-made, and not just Islamist-engineered, world catastrophes. And, although the work referenced some Islamist influences upon systems, it drew mostly from the French — Le Bon and Hugo — and Soviet observers’ efforts, referring there mostly to Vitya Kravchenko, Robert Conquest and for my grassrootist invested learning money the greatest academic mind for the understanding of terrorism, Anna Geifman. Thanks to the American Bill of Rights, the perfectly, if not only, constructed set of management agreements that have ever balanced individual against collective rights so that they fairly peacefully controlled people who suffer Mr. Nawaz’s periodic need for the application of, albeit in his case non physical, force in a way that ensured tranquility of and for human ontology, at least most of the time. Although we had one serious challenge to that balancing model’s efficacy in the mid nineteenth century, and apparently are nearing another one during this current attempt at transformation, so far the program has held together, and no matter that the Islamists say they don’t like us, in fact wanting to see us go. Those simple management structural changes — rescinding of death for blasphemy, defamation, and apostasy clauses, and then putting a lid on innards turmoil projection by stopping jihad — would, in this theory, re conform Islam into the standard, that is, more happy, joyous and free, religio-cult and less threatening apparatus. Later, you can probably even recommend fair treatment for women — including a more enlightened twenty-first century policy of no stoning, lashing or slashing for any reason. Girls could even get drivers licences in the more rigorously Shariah administered communities, and not even be killed for having been raped. The new and now strategically supported Islamic management program could no doubt then ascend, hopefully in record time, to a reformation level so far only achieved by Catholics, John Knoxers, Mongols, the sun worshipping early (indigenous pre Spanish invasion) Mexican Indians, and Tatars, all once being violent extremists, too. Surely if those groups, having once been rough, tough and rigidly hard-headed as they used to be, could change for the better, Islam could too. But it won’t without Dar al Harb’s, and of course despite its having its own identity and Behavioral management problems to seemingly always be addressed, setting the limits for the Islamic mental health disaster’s violently expressed deprecations upon the rest of the world. Dar al Harb certainly cannot expect to fix itself, that is to continue to define how the human consciousness best functions, if it is, otherwise, already dead. Now, as a member of Dar al Harb, a non believer, also called infidel, that is, somebody from the West who’s not a Muslim,38Although seemingly from the voting rights view to not be inclusive, here otherwise is an ETM TRT SHOM practical axiom for interaction with serious cultic managements. Members rarely right themselves from the group’s systemic controls, particularly when they are applied, again, seriously, i.e., when protected by death-for . . . clauses against complaining; and worse, the participants will sabotage attempts to rest the pathological controls from the mob’s applications, making cultic interventions in democracies problematic, at least. what do you think about these two views? That is, which narrative fits your best guess as to what this era’s Islamic terrorism is about, and which framing gives us the highest probability for doing something about all this anguish? A.) Psycho/Social failure (psychologically downtroddens with no jobs are more readily drawn to medieval management practices)? B.) Islamic management’s structural design factors and conflicts presenting during that religio-socio-political organization’s attempted reformation, combined with that activity’s perpetually traumatizing individual, systemic and global influences upon both itself and the external polity being targeted and attacked by the terror applications? And while doing so, I’ll be working on this SHOMblog’s Phase Two. It’ll show you how to do the right thing by both Islam and yourselves, giving the whole of humanity not just a break in the process of intensity that comes with trying to interact with an extra individual and social usurping megacult, but a serious chance at long-term survival of this part of the species. 1. ⇧ “Reforming Islam” refers here to the activity which is attempting to weed the more death defying political elements out of or away from the ontologically/spiritually-felt components. 3. ⇧ “Etiotropic” means to focus interpretation and management problem solving on etiology, to mean the “source of a problem.” Etiotropic is often better understood when juxtaposed to its opposite: Nosotropic approach to problem solving. “Nosotropic” means to focus on symptoms. 4. ⇧ Matthews, Chris, Interview with Marie Harf, Hardball with Chris Matthews, MSNBC, February 17, 2015 <https://www.youtube.com/watch?v=Sd0_U87nyoU>. 10. ⇧ Ali, Ayaan Hirsi (2015-03-24). Heretic: Why Islam Needs a Reformation Now (Kindle Locations 295-297). HarperCollins. Kindle Edition. 11. ⇧ Hall, Benjamin (2015-03-10). Inside ISIS: The Brutal Rise of a Terrorist Army. Center Street. Kindle Edition. 14. ⇧ Phares, Walid (2014-03-18). The Lost Spring: U.S. Policy in the Middle East and Catastrophes to Avoid (p. 94). St. Martin’s Press. Kindle Edition. 15. ⇧ Turkey Prime Minister Recep Tayyip Erdogan’s quote oft referenced either by the circumspect, or by Islamists attempting to emulate his country’s model of Islamic convergence with secular democratic government. 17. ⇧ Bokhari, Kamran; Senzai, Farid (2013-12-18). Political Islam in the Age of Democratization (Middle East Today) (pp. 188-189) Palgrave Macmillan. Kindle Edition. 19. ⇧ Qutb, Sayyid, 2005-09-01. Milestones, Kindle Edition. 21. ⇧ Ye’or, Bat, 2011-09-16. Europe, Globalization, and the Coming of the Universal Caliphate, Kindle Location 309. Fairleigh Dickinson. Kindle Edition. 22. ⇧ Al Hadith is repeatedly replete with explicit directions for divvying up the spoils of conquering through war. 23. ⇧ Trauma’s general categories are additionally and specifically described here. 24. ⇧ Thomas Asbridge, 2010-03-13, in The Crusades: The Authoritative History of the War for the Holy Land p. 20, HarperCollins. Kindle Edition, refers to the fragmented state of Islam coincidental, in that author’s view, to the eventual initiation of the Crusades in 1095. He documents the fracturing of the otherwise planned to be “monolithic” condition as it came about from the seventh century to the ends of the eleventh. And of course, it stands today. 25. ⇧ “Oppositionally and even Orderly” refers in this expression to the centuries of same conflicts presenting between sects or thought models, to include, but not limited to, such influences as idea, logic, narrative, ethnicity, doctrinal (exegete) controls, and demographics, like Shia vs Sunni, Salifi-violent vs Sufi-non violent, and/or Islamist political, either democratizing or non, and the same either violently presenting or not. 26. ⇧ “NOT linearally” is referring in this application to how one model may, for purposes of achieving short-term or warring goals, align with an otherwise counter, e.g., comprised of completely opposite to the point of historically clashing, Islamic conceptualizations. 27. ⇧ “Dissociations” refers here to the psychological separation of an entity’s (either manifested individually or as a collective) epistemological, philosophical/spiritual, and most rudimentary existential values core, and as well, the also trauma-skewed control apparatus that provides for its both every day coping and strategic sense of long-term continuity/ongoingness. 28. ⇧ As reflected in the Etiotropic approach to trauma management, “loss” functions as a consequence of neuromolecular extinction of the memory (synaptic traces) hosting the reality that existed before the event causing the loss occurred. 34. ⇧ Ali, Ayaan Hirsi (2015-03-24). Heretic: Why Islam Needs a Reformation Now (Kindle Locations 2056-2060). HarperCollins. Kindle Edition. 38. ⇧ Although seemingly from the voting rights view to not be inclusive, here otherwise is an ETM TRT SHOM practical axiom for interaction with serious cultic managements. Members rarely right themselves from the group’s systemic controls, particularly when they are applied, again, seriously, i.e., when protected by death-for . . . clauses against complaining; and worse, the participants will sabotage attempts to rest the pathological controls from the mob’s applications, making cultic interventions in democracies problematic, at least.